There are many types of kidney disease, most of which are potentially serious. Whether you get kidney disease is mostly due to bad luck, but whether it progresses to end-stage kidney failure does depend largely on what is done about it. 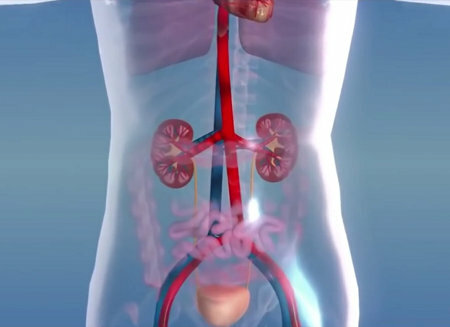 The kidneys, two fist-sized organs weighing about 150 grams (5 ounces) each, are located on either side of the spine just above the waist and perform a life-sustaining role. They cleanse the blood and help regulate blood pressure. Healthy kidneys help maintain the chemical composition of the blood within strict limits. They do this by increasing secretion of substances such as potassium and calcium when concentrations in the blood are too high, and by increasing reabsorption and decreasing secretion when levels are too low. Each adult kidney is composed of about 1 million nephrons, which are the functional structures of the kidney – they "do the work". Glomerular Filtration. The glomeruli, comprising small clumps of tiny blood vessels, filter water, glucose, salt and waste from the bloodstream into 'nephric filtrate' or 'glomerular filtrate'. Tubular Reabsorption. Most of the nephric filtrate is then recycled: hormones regulate the process in which water, glucose, amino acids, sodium and other important nutrients are resorbed into the bloodstream. In diabetics, excess glucose remains in the filtrate and can be detected in the urine. Tubular Secretion. After more substances are passed into the urine, it moves through the ureters into the urinary bladder. Excreting the waste products of metabolism. A patient with any sort of impaired kidney function will have increased creatinine and urea nitrogen in the blood, or azotemia. If the kidney is adequately perfused, is itself normal, and its outflow not obstructed, blood urea nitrogen levels will remain within normal limits. Regulating the body's content of water, sodium, and potassium. Hypertension, edema, and/or hyperkalemia may develop in patients with kidney disease. Renal edema is first visible around the patient's eyes. Maintaining the proper acid-base balance of plasma. Metabolic acidosis is characteristic of severe renal failure. High blood pressure, anemia, and bone demineralization are common in those with serious kidney disease. Renal insufficiency due to obstruction or underperfusion (reduced flow of fluid due to dehydration, shock or a failing heart) is extremely common. High blood pressure commonly results from kidney problems, and always damages the kidneys to some extent. 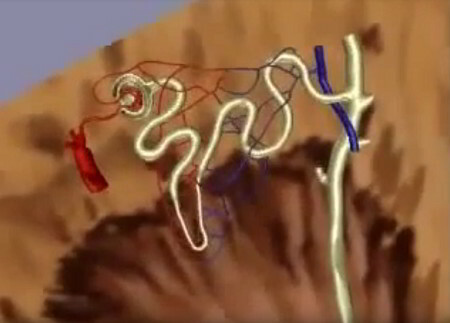 Hypertension in the kidneys can rupture glomerular capillaries and lead to scarring of the kidneys (nephrosclerosis). Chronic hypertension can lead to kidney failure. Acute renal failure usually manifests itself as oliguria plus azotemia. Hyperkalemia is the main threat to life during the oliguric phase. Chronic renal failure is the end result of irreversible kidney damage from any cause. Sometimes the cause of the "end-stage contracted kidney" cannot be determined even at autopsy. Once a sufficient number of nephrons are destroyed, it causes the remainder of them to die off inexorably. Anuria, the complete cessation of urine production, is rare in acute renal failure – the major exception being diffuse cortical necrosis. It may occur late in chronic renal failure. Much more often though, anuria is due to obstruction of ureters or urethra. When the kidneys become diseased or damaged, they can suddenly or gradually lose their ability to perform their vital functions. Waste products and excess fluid then build up inside the body, causing a variety of symptoms, particularly swelling of the hands and feet, shortness of breath, and a frequent urge to urinate. Symptoms include: increased urination at night; the passing of very small amounts of urine (oliguria); swelling, particularly of the hands and feet; puffiness around the eyes; azotemia (Increased levels of urea in blood); unpleasant taste in the mouth and urine-like odor to the breath; persistent fatigue or shortness of breath; loss of appetite; increasingly higher blood pressure; pale skin; excessively dry, persistently itchy skin. In children: increased fatigue and sleepiness; decrease in appetite; and eventually, poor growth. When the filtration membranes are damaged, proteins (such as albumin) and blood cells can pass through. Kidney disease can be detected by testing for proteins in the urine (proteinuria) or blood in the urine (hematuria). Measurements of both kidney function and structure are very important for minimizing kidney disease. Blood tests, urine tests, ultrasound imaging, CT scans, and MRIs are used. Some kidney diseases are genetic, such as Polycystic Kidney Disease (PKD). The kidneys become filled with cysts, which cause the kidneys to become less effective, and eventually leads to kidney failure. A variant of PKD is not usually detected until adulthood. This is known as "adult PKD", as the symptoms usually do not occur until patients are well into adulthood. However, with advances in diagnostic imaging technology, doctors are gradually becoming able to detect these conditions before symptoms appear. Since the kidneys need to process a huge amount of daily waste, adequate water intake is essential for them to continue functioning properly. Using kidney herbs occasionally or going on a kidney cleanse once or twice a year is a good practice to reduce the likelihood of progressive kidney damage or stone formation. There are many kidney cleansing products available at health food stores. Any of them should generally be safe to use in moderation. If left untreated, diseased kidneys may eventually stop functioning. Loss of kidney function is a very serious and potentially fatal condition. Spontaneous recovery of renal function is rare but does occur (around 1%, more in patients with lupus) [Am. J. Kid. DIs. 15: p.61, 1990]. High blood pressure commonly results from kidney problems, and often damages the small blood vessels in the kidneys. When this happens, the blood vessels cannot filter toxins from the blood as easily. An unpleasant taste in the mouth is a possible symptom of kidney disease. For reasons not yet fully understood, adults without teeth appear more likely to have chronic kidney disease. Pale skin is a possible symptom of kidney disease. Changes in the frequency of urination, especially at night, may indicate kidney disease. Diverse kidney problems can arise from the deposition of circulating immune complexes in the kidneys. Lupus, being an auto-immune disease, causes the immune system to attack the body's own tissues. The commonly affected organs/tissues are skin, joints, nervous system and kidneys. Renal insufficiency due to underperfusion from a failing heart is more widespread than commonly thought. Kidney disease, including kidney failure, is a possible symptom of mercury toxicity. A kidney stone that is obstructing will cause damage to the kidneys in the long run if left untreated and may even lead to end stage kidney failure. Anyone with a past history of kidney stones should have regular screening performed as the recurrence rate is high. Heroin use often leads to heroin nephropathy. Some non-prescription medications – especially painkillers – can potentially cause damage to the kidneys. This includes traditional Chinese 'herbal' medications. Followers of diets such as Atkins' risk kidney damage [New England Journal of Medicine 307 (1982): p.652]. Atkins once wrote, "The diet is safe for people even if there is a mild kidney malfunction." We now know this to be false. In a press release entitled "American Kidney Fund Warns About Impact of High-Protein Diets on Kidney Health," their Chair of Medical Affairs Paul W. Crawford, M.D., wrote, "We have long suspected that high-protein weight loss diets could have a negative impact on the kidneys, and now we have research to support our suspicions." [American Kidney Fund news release, 25 April 2002] Dr. Crawford is worried that the strain put on the kidneys could result in irreversible "scarring in the kidneys." Hyperuricemia is caused by a variety of means, one of which is abnormal kidney function. In addition, for some individuals gout is a progressive, crippling chronic disease that eventually damages the kidneys. Hydrangea is best known for its solvent properties that help break down and prevent further formation of stones and deposits in the urinary system. Hydrangea has been used for hundreds of years in folk medicine to contribute to the elimination of deposits in the bladder and kidneys. Gravel root is used primarily for kidney stones or gravel. Golden Rod encourages proper kidney function and was used extensively by the Indians for most kidney disorders. Parsley contains essential oils; the most important one, apiol, is a kidney stimulant. Individuals with kidney dysfunction may have trouble excreting potassium and should only take potassium supplements under the observation of their doctor.